Small Businesses that Deliver Results. Small businesses in Florida have so many website design and website marketing options that it's difficult for many to decide how to go about developing your company website, or even redesigning an outdated website. Website templates and cheap hosting will most always yield undesirable results. We believe small business website design in Tampa should be accessible, affordable and custom built. Florida small business owners, women business owners including Mom and Pop small businesses deserve affordable and custom built website design services that won't break the bank. Call us today at (813)778-9548 for a friendly, no hassle quote or simply email us with your specific requirements. Bay Area Graphics and Marketing is a Tampa web design company offering Florida business owners custom website design and internet marketing services that are tailored to your specific needs. To begin, choose a 6, 12 or 24 page custom designed website package to reflect your needs. With our custom websites, no templates are used to preserve your brand. If you need more features or pages, or a WordPress website, that's okay, just choose a package then we'll add a variety of features or additional pages to suit your needs. Our Tampa web design firm has been serving Florida customers for over a decade. You can rest easy knowing that obtaining your website updates will be easy, reliable and affordable. *Additional custom web development services are available for larger websites or sites that require specific functionalities. - A variety of website design and website maintenance services for Tampa & Florida business owners. - Marketing services that help you to promote your Tampa Bay business affordably, effectively and with just one call. - Customer Service - We answer our phones, emails and provide personalized attention and service. If you need web design and SEO services in and around Tampa including Temple Terrace, South Tampa, Lutz, Land O Lakes, Wesley Chapel, New Port Richey and Spring Hill, give us a call at (813) 778-9548. Get a 6, 12 or 24 page Custom Website Suitable for Tampa and Florida Small Businesses. WordPress Website Design & Update Services - Please contact us directly to discuss your needs. We will be happy to provide you with a quote that fits your needs and your budget. Search engine optimization services can be costly for Tampa and Florida small business owners. We believe that small business owners deserve effective, affordable SEO services. Tampa small business search engine optimization services can be obtain "on the fly" and at an affordable hourly rate. Clients who wish to assist with their own marketing often meet opposition with other web design or website marketing firms. We'll show you how to perform certain tasks properly that will assist with improving your organic ranking. If you don't have time and you're looking for SEO in Tampa we can manage all or just a portion of your search engine optimization tasks. You can depend on us to provide you with outstanding website design services for your Tampa or Florida business as well as reliable, personalized customer service. 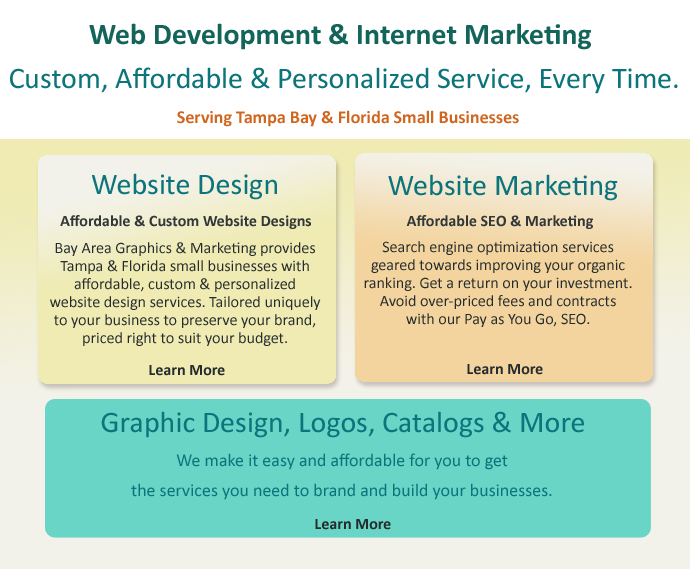 Small Business Website Design Strategies for Tampa & Florida Businesses that Deliver Results. I'm a Small Business Owner in Tampa, Florida , Can I Afford Your Website Design and Maintenance Services? Once Your Custom Small Business Website is Developed, How Much Will it Cost to Maintain It? Maintaining and marketing your website once it is launched takes time, effort and knowledge. Designing a fully optimized website is so important and yet so many clients come to us with sites that looked good, but were not optimized. If you need affordable small business SEO and marketing services that allows you to combine website maintenance along with updates and marketing at a reasonable rate, reach out to us today. Our goal is to help small Florida businesses compete online without alot of fuss. Start seeing a return on your investment regardless of your budget.